II cl. 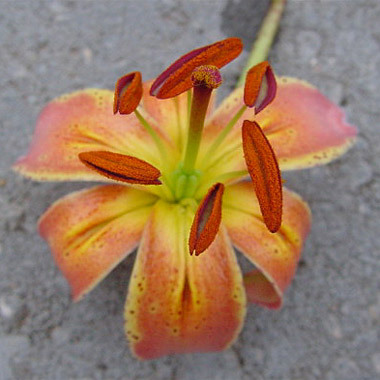 (Un-named L. martagon hybrid x un-named L. martagon hybrid) H:1982, G:1977, N:1988 &Reg:1988: F.Tarlton I: Honeywood Lilies. Near strong yellowish pink (34D), tips strong purplish pink (68D), throat strong orange (25A), outside light orange-yellow (22B) at edges merging to 68B in centre; many purple spots on inner « of each petal; nectaries strong orange (25A); pollen strong orange (26A). Petals 40 x 16mm, not ruffled, moderately recurved. Lvs whorled, 80 x 25mm, mid green. Stems 0.9m, light green, with c14 fls. June.